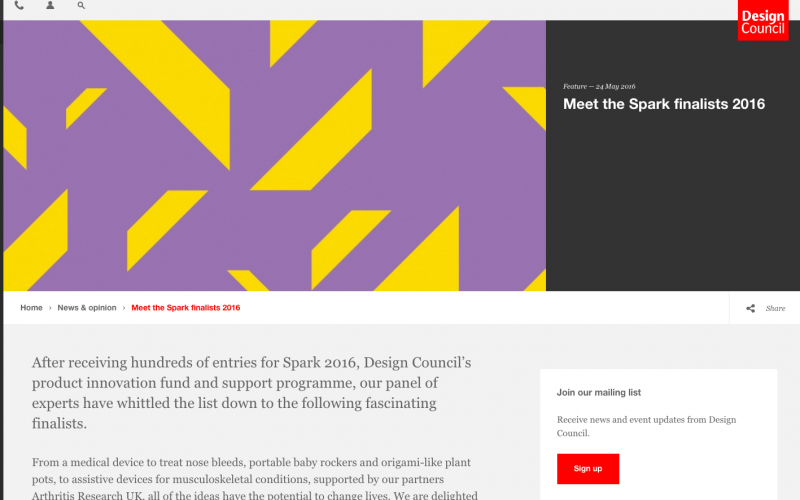 Having scoured hundreds of entries to its leading product innovation fund and accelerator programme, on 20 September, Design Council will showcase more than a dozen of its Spark programme’s pioneering products. As part of the prestigious London Design Festival, London City Hall will be host to this event, which will be attended by leading practitioners in product innovation, investment, manufacturing and retail, to see these unique products up close and to find out who will be awarded further funding of up to £150,000 to help take their product to market. With the support of this year’s partner, the charity Arthritis Research UK, Design Council will also award one finalist£50,000 of funding if their product is designed to assist those with arthritis. Showcasing more than a dozen inventive product ideas – ranging from a medical device to treat chronic nose bleeds, an automatic rocking device which fits to any baby’s pram or crib, a lightweight camera rig for shooting Hollywood-style video effects on a fraction of the budget, and origami-inspired expanding plant pots – this is the second year that Design Council Spark has helped the UK’s entrepreneurs of tomorrow take their product ideas to market. The event celebrates the completion of this year’s spring/summer 20-week support programme, provided by Design Council Spark’s experts and mentors. As one of the UK’s leading product innovation programmes, Spark boasts an illustrious panel of more than 60 specialists, providing top-level experience in branding, IP, business planning, product design, manufacturing, and sales and commercialisation.